It’s almost time for the most refreshing event of Portsmouth Beer Week! North Country & Earth Eagle Brewings have teamed up again to host a palate cleansing event just for you. 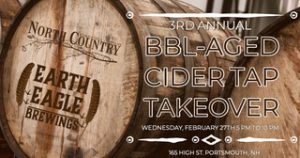 We’ll be offering 5 AMAZING Barrel-aged beauties from North Country Cider, offering full & half pours, beer & cider flights, & a few of EEB’s own savory apple snack specials to wash it all down. This event is open to the public and does not require a ticket or reservations.